We show that existing constraint manipulation technology incorporated in the paradigm of symbolic model checking with rich assertional languages [KMM+97], can be successfully applied to the verification of client-server protocols with a finite but unbounded number of clients. Abstract interpretation is the mathematical bridge between protocol specifications and the constraint-based verification method on heterogeneous data used in the Action Language Verifier, a model checker for CTL [BYK01]. The method we propose is incomplete but fully automatic and sound for safety and liveness properties. Suficient conditions for termination of the resulting procedures can be derived by using the theory of [ACJT96]. 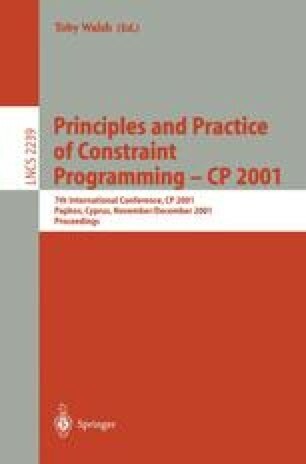 As a case-study, we apply the method to check safety and liveness properties for a formal model of Steve German’s directory based consistency protocol [PRZ01]. The work by Tevfik Bultan is supported in part by NSF grant CCR-9970976 and NSF CAREER award CCR-9984822. Fabio Somenzi. CUDD: the CU Decision Diagram Package, Release 2.3.1. http://vlsi.colorado.edu/~fabio/cudd/. W. Kelly, V. Maslov, W. Pugh, E. Rosser, T. Shpeisman, and D. Wonnacott. The Omega library interface guide. Technical Report CS-TR-3445, Department of Computer Science, University of Maryland, College Park, March 1995. See also http://www.cs.umd.edu/projects/omega/.